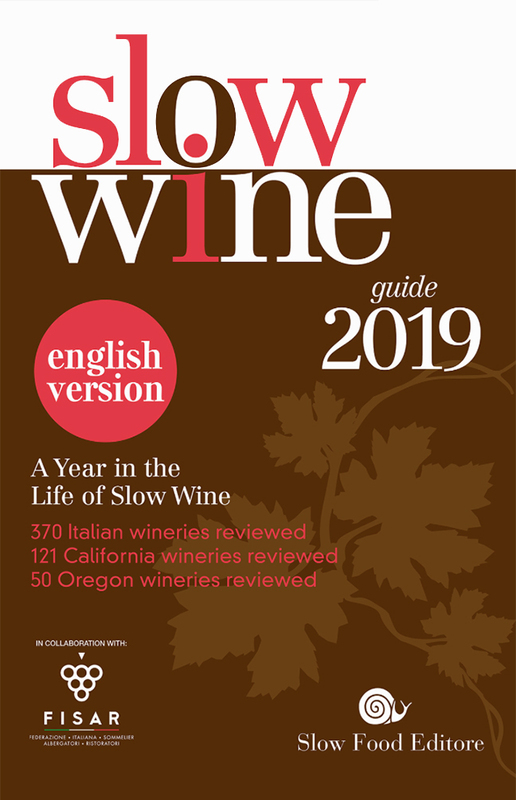 Here’s an updated link for a free download of the 2019 Slow Wine Guide (the previously link is now stale because so many people used it fyi). Wondering why this post preceded by an image culled from a (public domain) vintage poster for the 1968 science fiction classic “Barbarella”? Read on. Ever since the Italian-English wine glossary was first launched here, Maurizio Gily — a leading Italian agronomist, writer, publisher, and professor at the University of Gastronomic Sciences in Piedmont – has lent a hand in fine-tuning the entries. Most recently, he shared the following note from a California grower, who points out that barbatella can be translated in a variety of ways in English depending on context. The entry has been updated accordingly and Maurizio has graciously and generously added a number of new entries as well (thank you, Maurizio!). In case you’ve never seen a barbatella — a rooted cutting (otherwise known as a bench graft) — here’s a video shot at Vivai Cooperativi Rauscedo, the famed Italian nursery that provides bench grafts to wineries and growers across the world (it’s in Italian but it shows how the rooted cuttings/bench grafts are prepared and shipped etc.). Thanks for being here and thanks for speaking Italian wine! In my experience, I have heard “greengrowers” used for grafted vines that have been planted in pots with soil and “bench grafts” used for dormant scion/rootstock grafted vines. All that being said, I like the name “barbatella” much better. Reminds me of a young Jane Fonda for some reason… she starred in a movie back in the 1960s called Barbarella. “A stadium crowd cheering between organic and not organic.” Responses to Italian organic farming controversy. 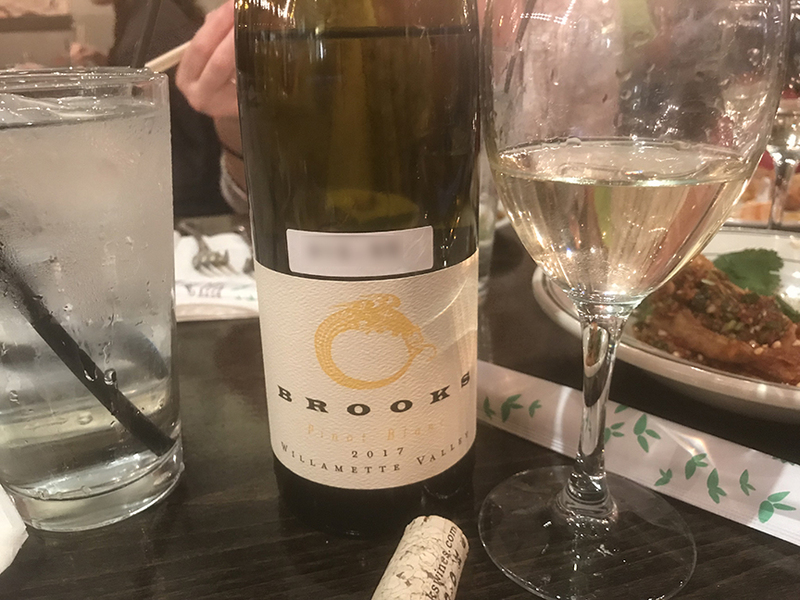 Above: last night’s BYOB wine was the 2017 Brooks Crannell Vineyard Pinot Blanc from Oregon’s Eola-Amity Hills. Many of Brooks wines are biodynamic certified but the fruit for this bottling is not. No certification is listed for Crannell Vineyard but according to info available online, it is “dry farmed without any irrigation.” 100% delicious, with vibrant fruit and racy acidity, a perfect pairing for Cantonese. There were a lot of responses to this week’s post on opposition to proposed legislation in Italy that would create new protections and incentives for organic farmers. The bill was approved by Italy’s lower chamber and is now being considered by the Italian senate. It would create a tax on conventional farming and require public schools and institutions to serve organic food products. Opponents of the bill, which is likely to be approved, counter that global-scale organic farming is unsustainable and a threat to nutritional security and the nation’s health. Authors of the bill claim that organic farming is vital to the nation’s identity, health, and nutritional future. In a comment thread, he wrote me that an official response from his office in support of the bill had already been prepared and is currently being vetted by the university’s lawyers and technical advisors. I’ll post updates on this story as it develops. Thanks for being here. Organic farming, a “beautiful but impossible fairy tale.” Italian scientists oppose proposed organic regulation. The vineyard in the photo above is farmed by one of Italy’s most prestigious wineries. It provides fruit for one of the estate’s marquee wines. Although many Italian wine trade observers assume it’s an organically farmed parcel, it’s actually farmed conventionally. The winemakers contend that conventional farming is actually better for consumers and for the planet. As the Italian senate is about to consider newly introduced legislation that would promote and protect organic farming, calling it vital to the nation’s health and environment, nearly 400 Italian scientists have signed an open letter opposing the bill, which has already been approved by Italy’s lower chamber. The researchers argue that organic farming, if adopted on a global scale, is unsustainable and would lead to weakened nutritional security. They also point to aggressive marketing — and not sustainability — as the driver behind the popularity of organic products among consumers. Only privileged Italians can afford organic food products, they note. And they point out that organically farmed products represent a negligible amount of foods that Italians consume. The letter was delivered in January of this year, with more than 200 signatures. As of last week, that number had grown to almost 400. On Friday, Il Sole 24 Ore (the Italian Financial Times) published an interview with Elena Cattaneo, one of Italy’s leading researchers and a senator for life in Italy’s parliament. She has joined her colleagues in opposing the bill. The following is an excerpted translation of her remarks (see this Wiki entry on Dr. Cattaneo). The following are my paraphrases of the letter’s 10 bullet points in which the scientists explain their motivation for opposing the legislation. The bill calls, among other things, for all public institutions and schools in Italy to serve only organically farmed food products. Unfortunately, the letter hasn’t been translated in its entirety. If you speak Italian, I highly encourage you to read it. 1) Low production rates in organic farming. According to currently available data, organic farming yields 20 to 70 percent less than conventional farming. 2) Ecological sustainability for individual farming companies should be more closely examined. Even organic farms depend on agricultural products that come from the world of conventional farming. 3) Global sustainability of organic farming should be more closely examined in terms of its environmental friendliness. If organic farming were adopted on a global level, the surface area devoted to agriculture would have to be doubled. The subsequent scarcity of nitrogen in the land (owed to the fact that synthetic fertilizers would no longer be used) would lead to severe famine. 4) Global sustainability of organic farming should be more closely examined also in terms of its economic and social impact. If organic farming were adopted on a global level, consumers wouldn’t have the same level of access to fruit and vegetables. The impact on health — especially in terms of the occurrence of cancer — could be enormous. 5) Marketing of organic farming aims to denigrate conventional farming even though the latter is productive, efficient, and indispensable to the nation. Convention and integrated farming provides 97 percent of the food Italians eat and the difference in quality between organic and conventional and integrated foods is negligible. Only the privileged classes have access to organically farmed foods. 6) Is organic farming really growing? The number of certified organic farms in Italy actually shrank from 58,000 in 2001 to 57,000 in 2017. The sector is essentially stagnant and isn’t showing signs of growth. 7) Organic farming accounts for only a small segment of the farming sector. In 2018, only 3 percent of foods consumed in Italy were organically farmed. That’s a small increase over 2017 but the figure is reflection of organic foods’ “niche” in the market, heavily dependent on marketing that doesn’t represent Italian agriculture in general. 8) Organic farming is highly subsidized thanks to aggressive marketing. Organic farmers actually receive more subsidies than conventional farmers because additional funds and incentives are earmarked especially for organic farming. Marketing drives this financial model. 9) Organic farming depends, however counterintuitive it mays seem, on synthetic products. Even though an individual farm may avoid the use of synthetic products, its sustainability still depends on the overarching farming system where synthetic products are used. 10) Organic farming is opposed to genetic innovation and technical advances in farming technology. Increasingly, farmers will need to look to genetic innovation and technical advances in farming to feed the nation. Italy’s nutritional security depends on innovation. Registration for Slow Wine tastings in Denver (tomorrow), Boston and New York (next week) is still open. Click here for details. Here are some highlights from the Slow Wine tastings in San Francisco and Oregon this week. Heartfelt thanks to all the winemakers who participated and all the trade members who came out to taste. That’s a whole lotta wine right there! 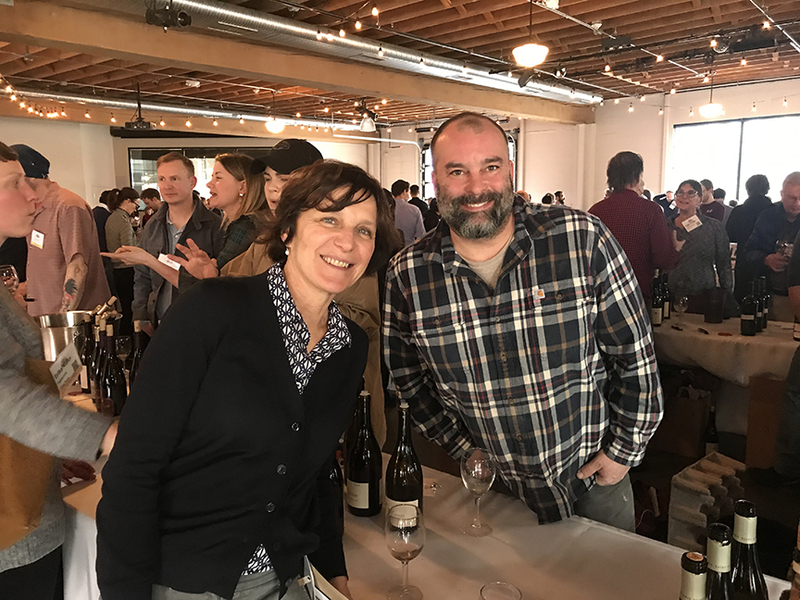 Matile Poggi of Le Fraghe (left, one of my wine heroes, for her FIVI leadership) and Andrew Beckham of Beckham Estate Vineyard in Oregon’s Chehalem Mountains. 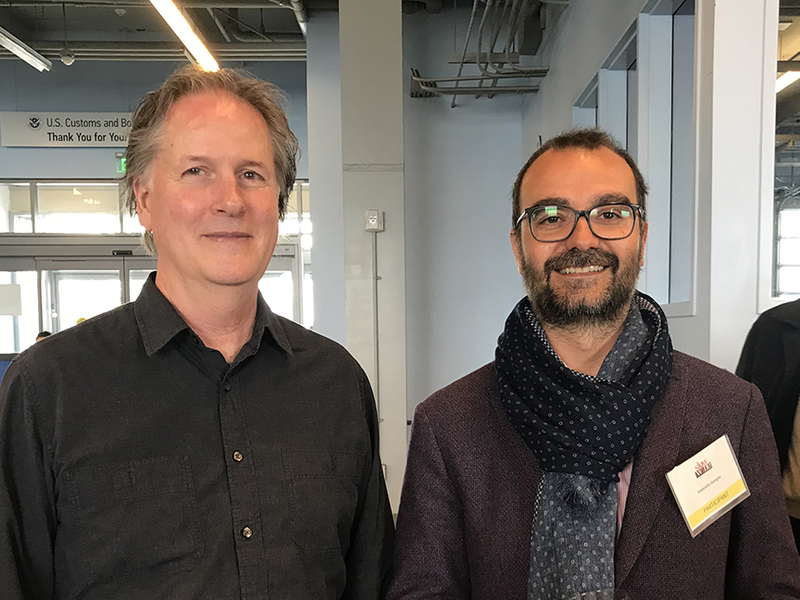 Slow Wine editor-in-chief Giancarlo Gariglio (left) with California wine legend Robert Sinskey. I have to confess to being a bit starstruck when meeting Robert, whose wines were among the first Californians I swooned over as an adolescent wine lover. Soil samples from the Russian River Valley at the Small Vines table. Slinging dirt is a great way to teach people about your wines, remarked winemaker Paul Sloan. Mitico! 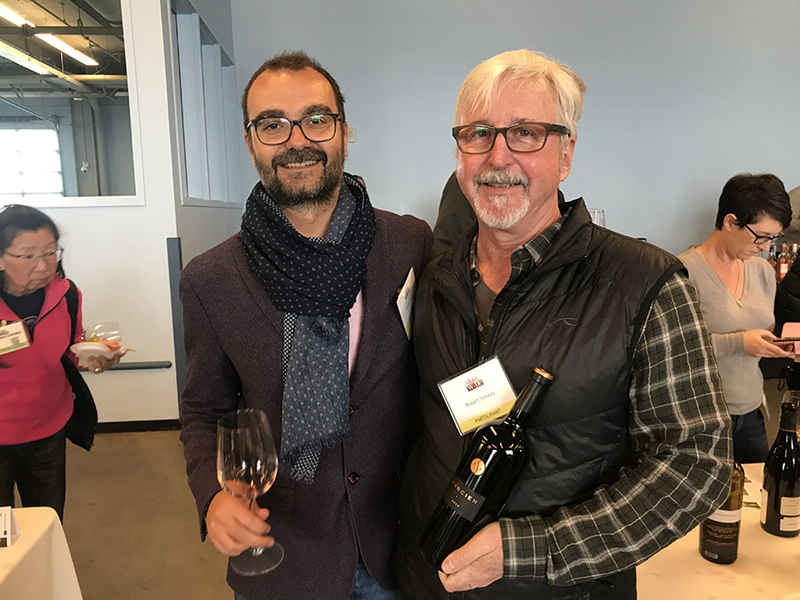 Dan Petroski (left) poured Larkmead Vineyards for Giancarlo. Dan’s Massican wines were also in the guide this year. 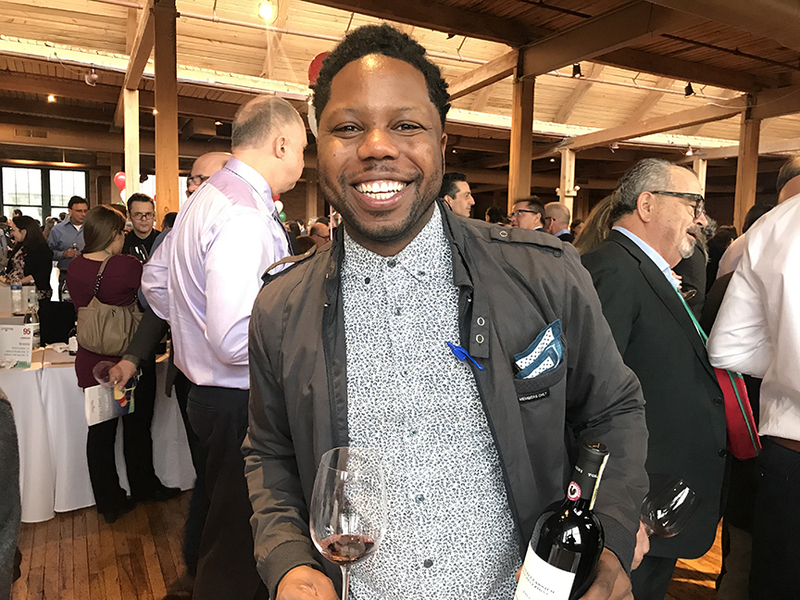 Above: Chicago-based Derrick Westbrook is one of the most dynamic wine professionals working in the U.S. today. And he digs and pours Italian wine. It’s not every day that a Friuli fanatic discovers an indigenous Friulian grape variety he’s never tasted before. 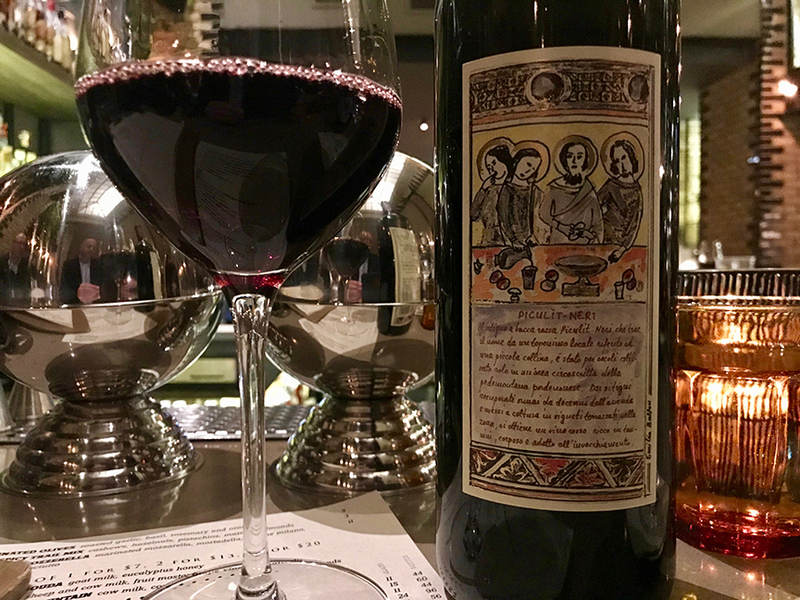 But that’s exactly what happened on a chllly midwest evening when a couple of Italian wine trade professionals sat down at the bar at Nico Osteria in Chicago’s Gold Coast district. Wine director Bret Heiar’s Italian-focused program there is one of the most exciting wine lists I’ve seen this year. And the aggressive pricing is the first clue that this is an Italian wine list written by someone who really loves Italian wines and who wants people to experience them. The night we were there, they were pouring Emilio Bulfon Piculìt Neri by the glass — yes, by the glass, people! Above: when’s the last time you saw a Piculìt Neri by the glass? Or ever? I was also really geeked to see American sommelier superstar Derrick Westbrook pouring at the Gambero Rosso event last week. His career is on FIRE right now and it was so cool that he was pouring and talking about Chianti Classico there. He’s also the nicest guy. We need energized, think-out-of-the-box folks like him working with Italian wine as we move forward in our increasingly media- and product-saturated markets. Man, this dude is going to go far and I’m glad he’s taking Italian wine with him. While in Chicago, I also checked in with another one of the country’s hippest sommeliers, Rachael Lowe, who’s been shepherding one of our nation’s historic Italian fine wine lists at the legendary Spiaggia. I remember going there when I was still in college back in the late 1980s after my first trip to Italy. At the time, there were only two or three programs like that in the U.S. I”m glad to see that it’s still going strong stronger than ever. It couldn’t be in better hands. 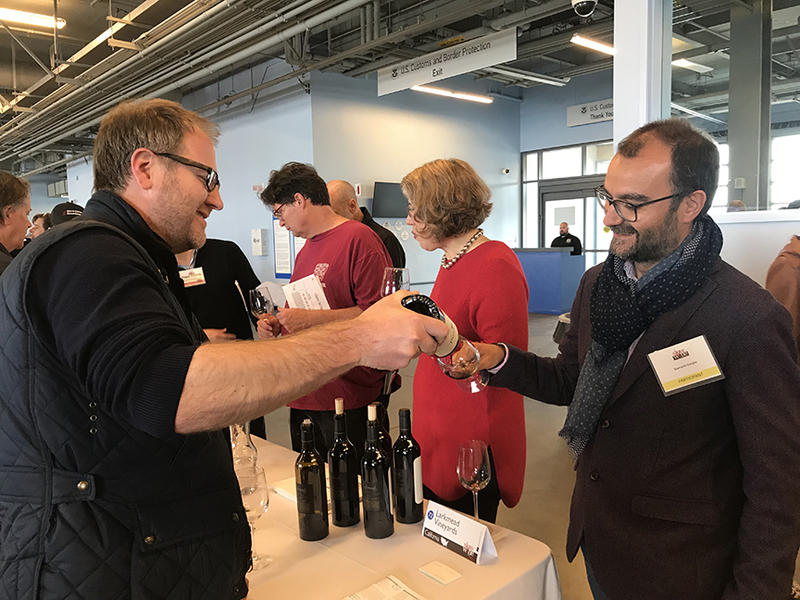 Another person I was geeked to catch up with was my buddy Craig Perman who runs Perman Wine Selections, one of the grooviest Italian-focused retail programs in the U.S. In a town notorious for its corporate-driven market, Craig keeps fighting the good independent fight. His knowledge of Italian wine is spectacular and he’s doing truly great work in bringing real-deal Italian wines to a market that is evermore thirsty for them. I was bummed not to make it to Monteverde where one of the city’s most progressive Italian lists has a home. I hear that the restaurant is currently between wine directors but I’ll be following along closely and hope to get back there to check it out soon. I’ve spent a lot of time in Chicago over the last decade and I’ve never seen so much great Italian wine and so many mega-talented people running a growing number of Italian-focus programs. I can’t wait to get back there later this year. Keep on keepin’ on, yall! 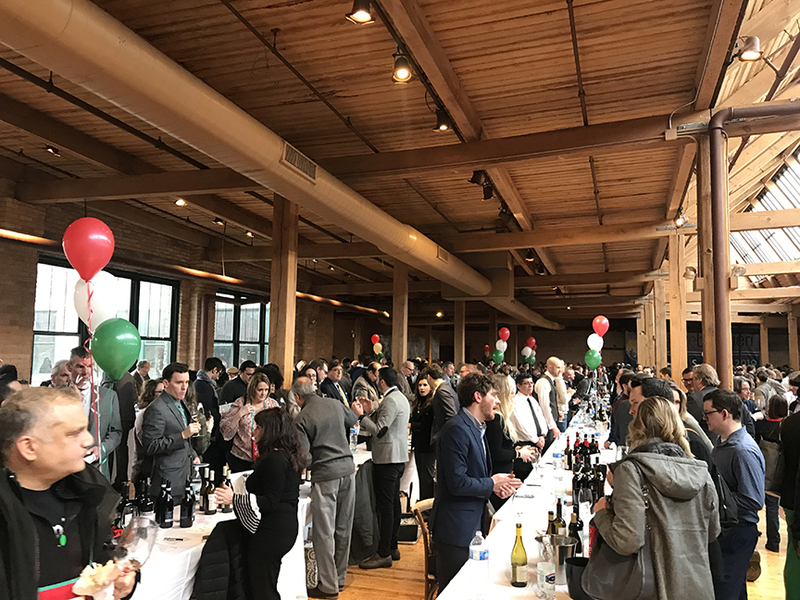 Above: the Gambero Rosso tasting in Chicago on Wednesday was packed. Calling all wine people in New York: please come out and taste with me at Gambero Rosso this afternoon in Manhattan! I’ll be pouring Villa Sandi Prosecco. And in case you are on the west coast next week, I’ll be hanging and tasting (although not pouring) at the Slow Wine events in San Francisco and Portland on Monday and Tuesday. I hope to see you there! Thanks for your support. The Slow Wine Guide 2019 tour begins on Monday, March 4 in San Francisco and then moves on to Portland (Oregon), Denver, New York, and Boston. Click here for tasting and registration details. One of the things that flummoxed the editors of the 2018 Slow Wine Guide to the wines of California was how to treat the often thorny subject of who is and who is not a genuine organic grape grower. On the one hand, organic viticulture is widespread in California where extremely dry conditions make it easier to farm without the application of fungicides commonly used to combat peronospora (downy mildew). 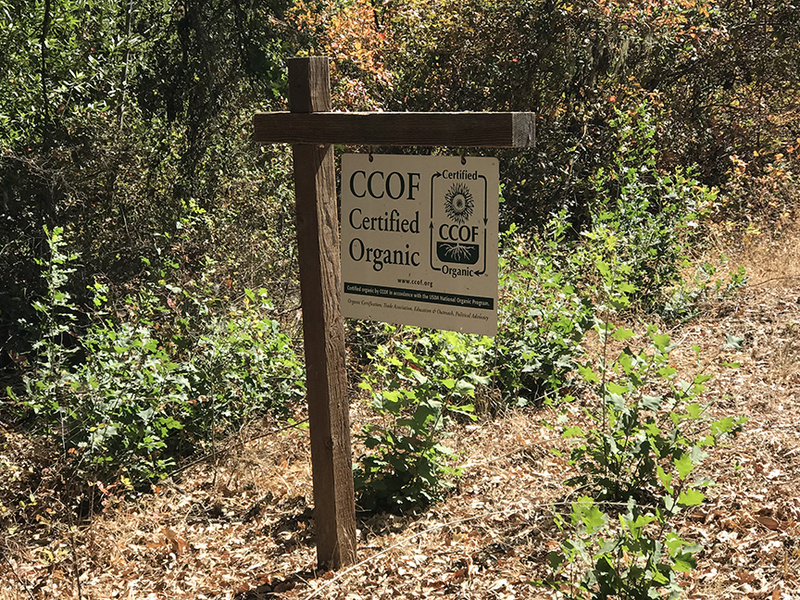 On the other hand, there are myriad legacy growers in the Golden State who have no interest in obtaining organic certification even though they have employed organic practices for decades, often since the first planting of their vineyards. Add to this mix the fact that exorbitant land prices in California make it nearly impossible for smaller-scale winemakers to own the vineyards where they source fruit for their wines. Throughout the state, the cost of acreage in wine country is driven by “weekender” owners whose primary income isn’t derived from viticulture. 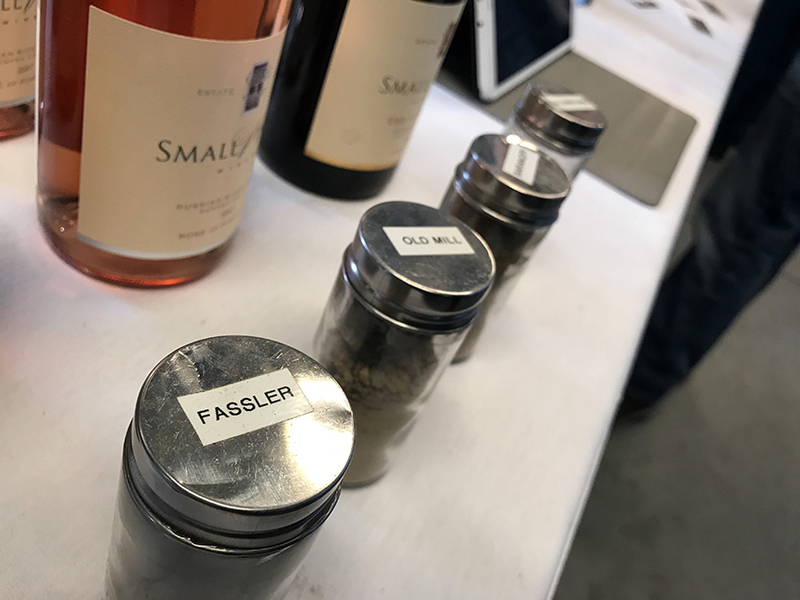 As a result, the California wine industry — especially as relates to producers who embrace the Slow Wine ethos — is highly parcellized. 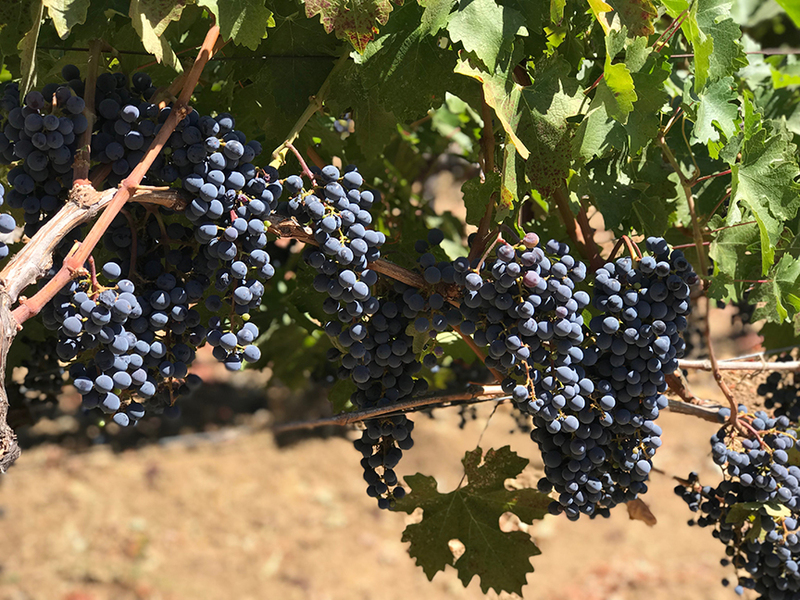 Even in “lower rent” districts like the Sierra Foothills AVA, it’s challenging for low-volume winemakers to grow their own fruit. Take Hank Beckmeyer’s La Clarine Farm, for example, one of my favorite wineries in the U.S. and a shoo-in for inclusion in the Slow Wine Guide. Above: organically certified Cabernet Sauvignon vines at Volker Eisele, one of my favorite Napa Valley growers. The vineyards there have been farmed organically since they were planted in the 1960s. And the owner was among the first to certify a Napa Valley grape farm. Hank — one of the most respected, beloved, and emblematic producers in California’s progressive movement — sources 100 percent of his fruit. And although all of those growers employ organic practices in their vineyards, none of them are organic certified. If organic certification were the sine qua non baseline for being profiled in the guide, our team of editors reasoned, we would have hardly had enough winemakers to fill the pages of the book. For the 2018 edition, we didn’t include certification status for every winery. But with the current 2019 guide, not only did we specify whether or not producers were certified organic, we also listed the number of acres owned by the winery. In many cases, as for La Clarine farm, that figure was zero acres owned and certification entry was annotated with “n/a” (not applicable). Unless a given estate is 100 percent certified organic (or biodyanmic as the case may be), its certification status is listed in the book as n/a. Editors were encouraged to quote growers and winemakers directly when it came to accounts of organic growing practices employed. And in many instances, they have specified that although organic farming is employed in the vineyards, the estate is not organic certified. But in order to be profiled as an “organic winemaker,” the estate had to be 100 percent certified and/or sourced fruit had to be 100 percent organic certified. This year’s California guide, the second edition, has nearly doubled the number of wineries profiled. And the debut edition of the Oregon guide profiles 50 wineries. The Italian editors of the guide are currently posting all the profiles on the Slow Food blog here — free for all. I’ll be attending the Slow Wine tastings in San Francisco next Monday and Portland, Oregon next Tuesday. I hope you’ll join me! My buddy Flavio Geretto and I will be pouring Villa Sandi Cartizze tomorrow in Chicago at the Gambero Rosso Tre Bicchieri event. Please join us if you’re in town (details here). 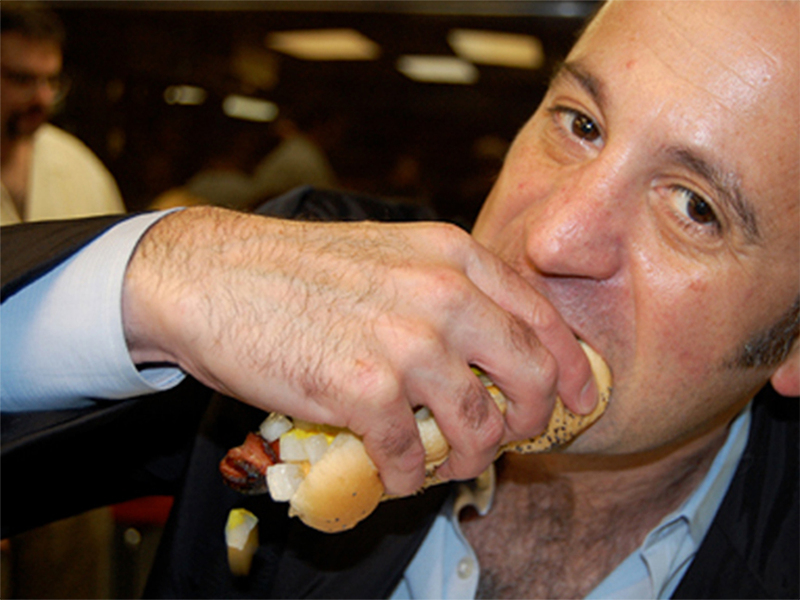 And if you can’t make to the Gambero, ping me and we’ll connect at Wieners Circle, one of my favorite hotdog stands in Chicago, one of my favorite cities in the world and the place where I was born. From there we head to New York for Gambero on Friday. And although I won’t be pouring, I will be hanging out and tasting at the Slow Wine tastings in San Francisco and Portland next week (details here). If you’ve never heard of or been to Weiners Circle, check out the Wiki: it’s a truly unique Amercana culinary destination (I could write a doctoral thesis about this place). That’s me, above, enjoying a Weiners Circle chardog a few years ago. I’ll be there on the late side… Ping me! 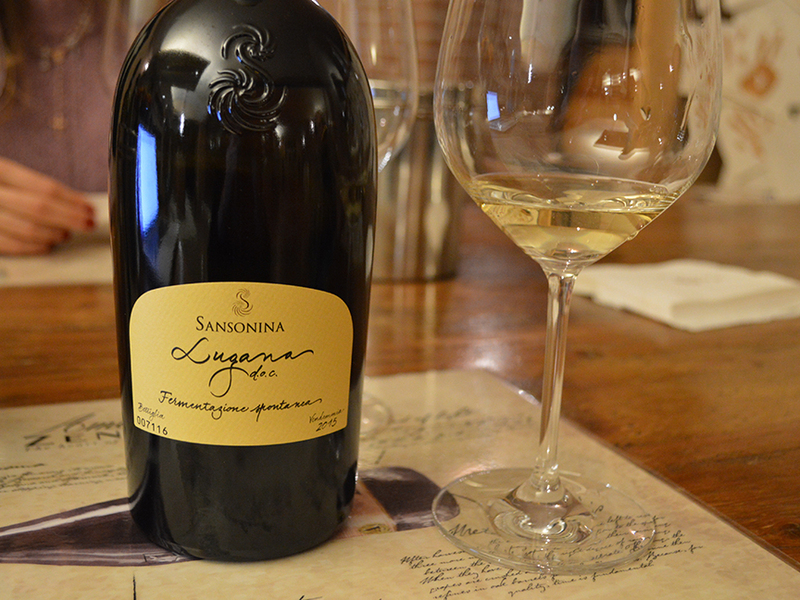 One of the wines that impressed me the most during my early February trip to Italy was this Lugana fermentazione spontanea (spontaneous fermentation) by the Sansonina estate, a property and label that Nadia Zenato is developing for her family. Back in the 2010s, she began experimenting with wild yeast fermentation using grapes sourced from a vineyard planted there in the 1970s. The first release of the wine was from the 2014 vintage. Man, this wine has eno-hipster written all over it! 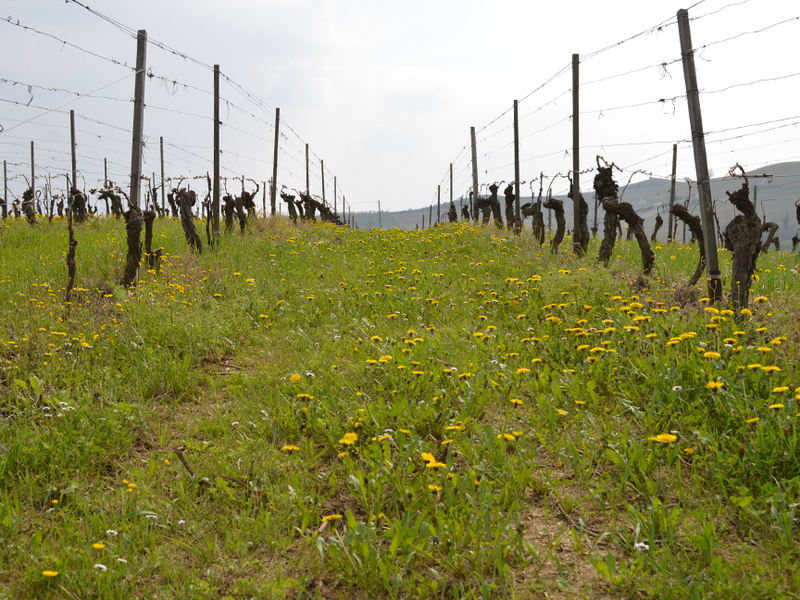 The “old-vine” (40+ year old) Vigna del Moraro vineyard — one of the Zenato family’s top holdings — is farmed organically, she said, and will soon be certified. It’s planted to Turbiana, the hyper-local clone of Trebbiano used to make monovarietal Lugana. The grapes are picked by hand and vinification is carried out in stainless steel using only naturally occurring yeast. I loved the way the savory component in this cru-designated wine played against the white flower notes on the nose and the fresh and gently dried stone fruit in the mouth. Subtle oxidative character accentuated the wine’s delicate almond notes that seemed to float ethereally throughout its body without ever weighing it down. The texture was lithe but balanced and confident in the mouth, the finish was a gift that just kept giving dried fruit and nuttiness. It made me feel so hip that I thought I was going to grow a handle-bar mustache! But just as I was about to break out my Brooklyn Grooming Commando Old School Pomade (animal fat and petroleum product free), it occurred to me that the word natural hadn’t been uttered during my tasting and conversation with Nadia. She seemed genuinely surprised when I speculated that the wine, hitherto unknown to me, must be a hit among the natural wine crowd. If ever there were a Lugana that “speaks of place,” that stands apart as an expression of “site,” this would be it, for sure. As we moved on to the estate’s flagship Merlot, also excellent, it occurred to me that Nadia hadn’t conceived this wine with marketing in mind. It was a challenge: a desire to create the purest and truest representation of an appellation her father helped to create and a vineyard that she and her mother hold extremely dear. I loved it and I admire Nadia for growing, raising, and bottling it. What a great wine — everything and nothing “natural” about it!